Back in the time when all paper was hand made, the edge of the frame the held the paper pulp was called the deckle. The wet pulp usually seeped between the frame and the deckle to result in a thin ragged edge on the paper sheet. This was just an unavoidable part of paper making. This edge assumed the name deckle and to get rid of it, the sheet had to be trimmed to have a clear, crisp edge, making the trimmed paper more expensive than the sheets that still had the deckle. Today's manufacturing process makes for a nicely cut edge; while practical, it doesn't have the look of an old-style hand-made paper. 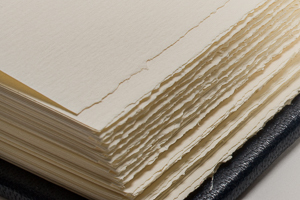 We love the look, and fortunately, we found paper that has this wonderful hand-made feel of a deckled edge. If you look closely at the picture of the book, you can see how some of the page edges are not deckled, but indeed cut. This is because the deckle is only of the side edges of the large sheet of paper as it comes from the mill; we trim it down to create a smaller sheet to be folded for the journal, which means that only one side has the deckle. We fold it so the deckle stands out a little more than the cut edge, and so it almost looks like every side has a deckle. Note that the top and and bottom of the pages have cut edges.